Movie review: Tom Hanks does a great job playing a man reluctantly dragged into geopolitical gamesmanship in this spy drama from Steven Spielberg. Although set more than 50 years ago, the picture strongly resonates with our present era of the war on terror. The hero is James Donovan (Tom Hanks), a prominent New York insurance attorney pressed to take on Abel’s defense to demonstrate to the world the fairness of the American justice system. The thing is, no one wants him to succeed — not the judge, and certainly not the government. 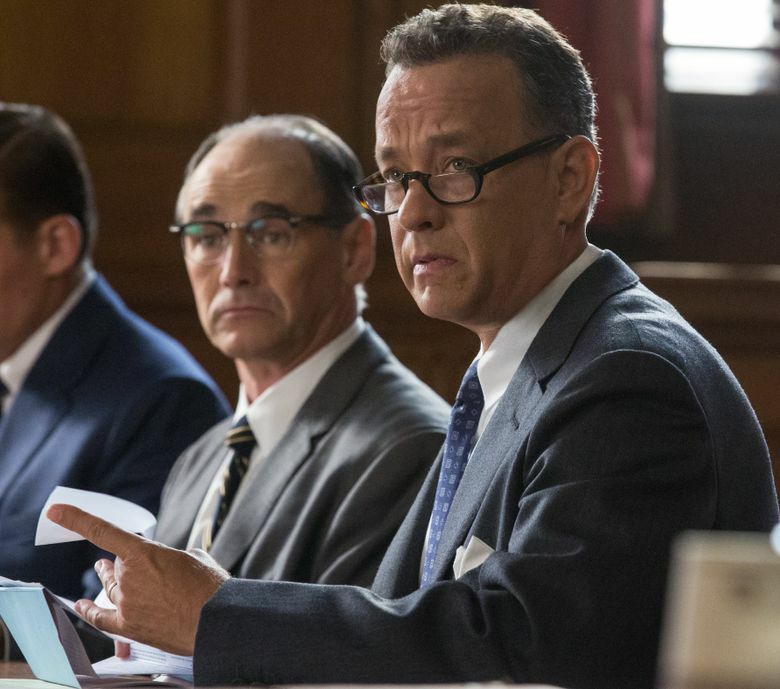 ‘Bridge of Spies,’ with Tom Hanks, Mark Rylance, Austin Stowell, Alan Alda. Directed by Steven Spielberg, from a screenplay by Matt Charman and Ethan and Joel Coen. 142 minutes. Rated PG-13 for some violence and brief strong language. Several theaters. Abel (Mark Rylance, enigmatic and soft-spoken) is viewed as being an enemy combatant not worthy of a vigorous defense, or indeed, much of a defense at all. The parallels between Abel’s case and the situation of detainees at Guantánamo Bay are strongly drawn. Donovan fervently believes in the rule of law. And he articulates that belief before the Supreme Court as he appeals Abel’s guilty verdict, arguing that it is “who we are” as Americans, and that the roadblocks raised to prevent Abel from getting a fair trial are badly at odds with that ideal. The picture turns into a hall-of-mirrors spy drama when, years after losing the case but persuading the judge to spare Abel from the death penalty, Donovan is approached by the U.S. government to go to East Germany to negotiate a swap of Abel for downed U-2 spy-plane pilot Francis Gary Powers (Austin Stowell). This mission is a forbiddingly ticklish one: He’s not an officially acknowledged negotiator, and the Soviets and East Germans he’s dealing with have conflicting agendas. Hanks does a great job playing Donovan as a man of essential decency who nevertheless is an expert negotiator and a hardheaded realist. The skill with which Hanks navigates the intricacies of the plot amount to some of the best work of his career.